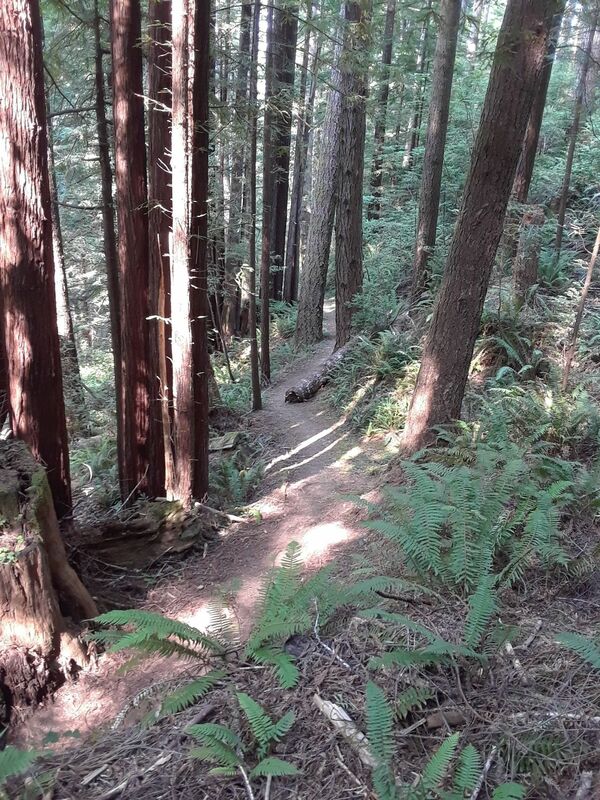 Looking for a great trail in Del Norte Coast Redwood State Park, California? 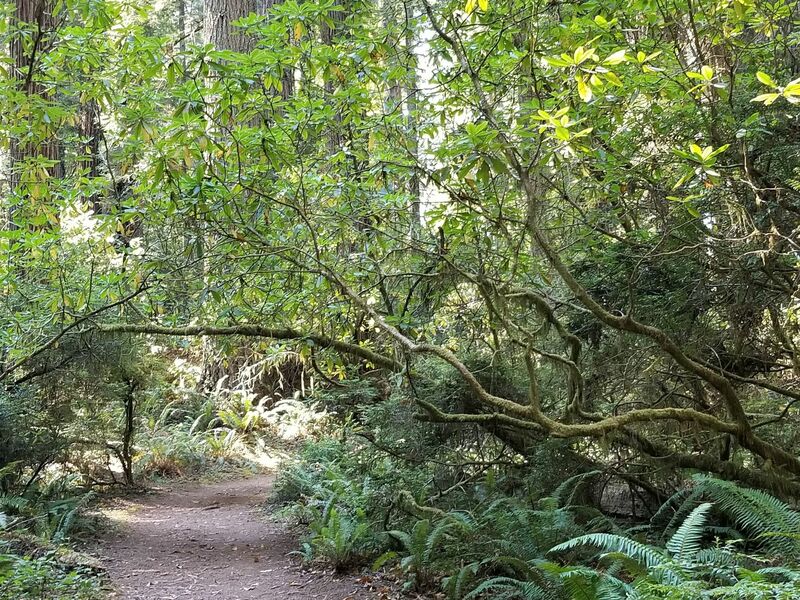 AllTrails has 7 great hiking trails, walking trails, dogs no trails and more, with hand-curated trail maps and driving directions as well as detailed reviews and photos from hikers, campers, and nature lovers like you. Ready for some activity? 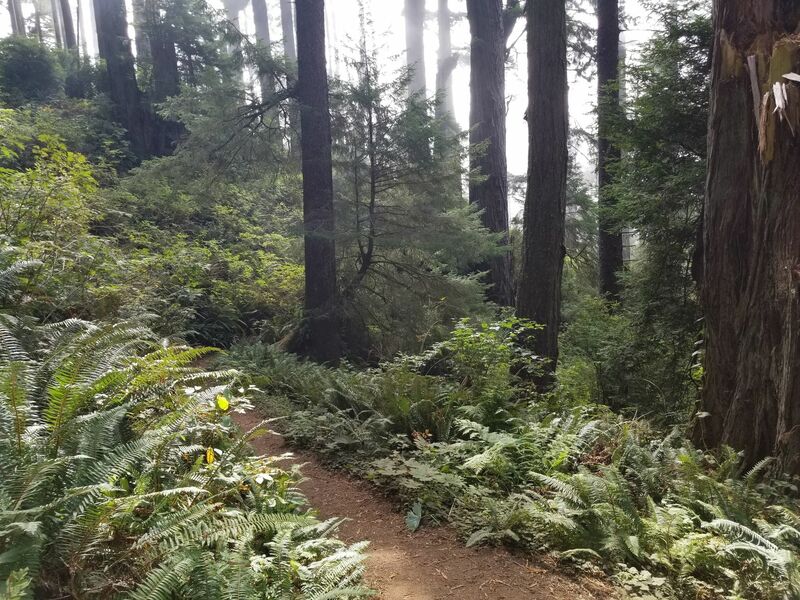 There are 5 moderate trails in Del Norte Coast Redwood State Park ranging from 1.3 to 3.8 miles and from 367 to 1,112 feet above sea level. Start checking them out and you'll be out on the trail in no time! 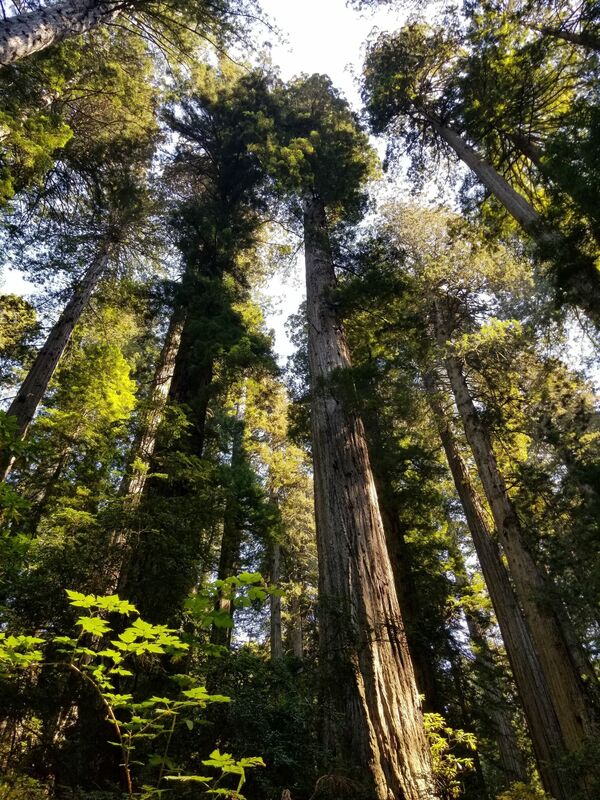 Del Norte Coast Redwoods State Park, established in 1927, has approximately 50% old growth coast redwood and eight miles of wild coastline. 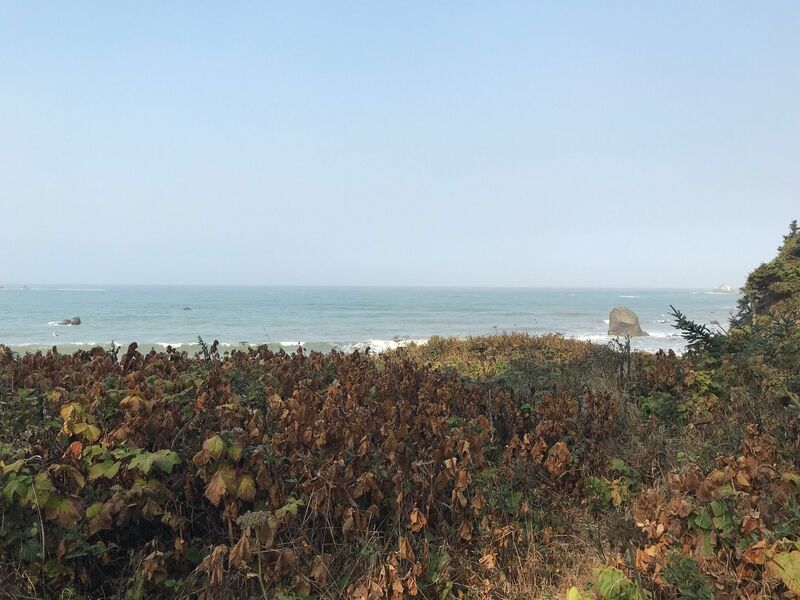 The park is located two miles off Highway 101 about 7 miles south of Crescent City. 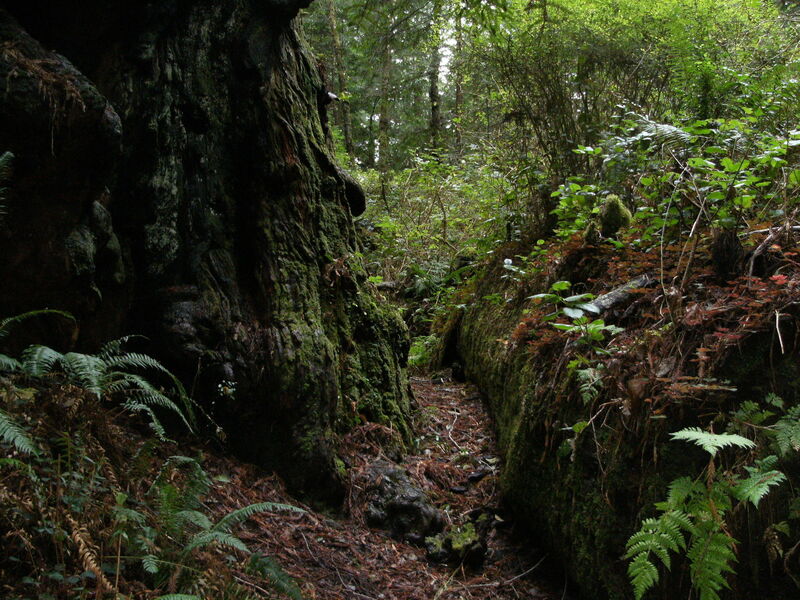 The mixed understory includes tanoak, madrone, red alder, big leaf maple, and California bay. Ground cover is dense with a wide range of species. 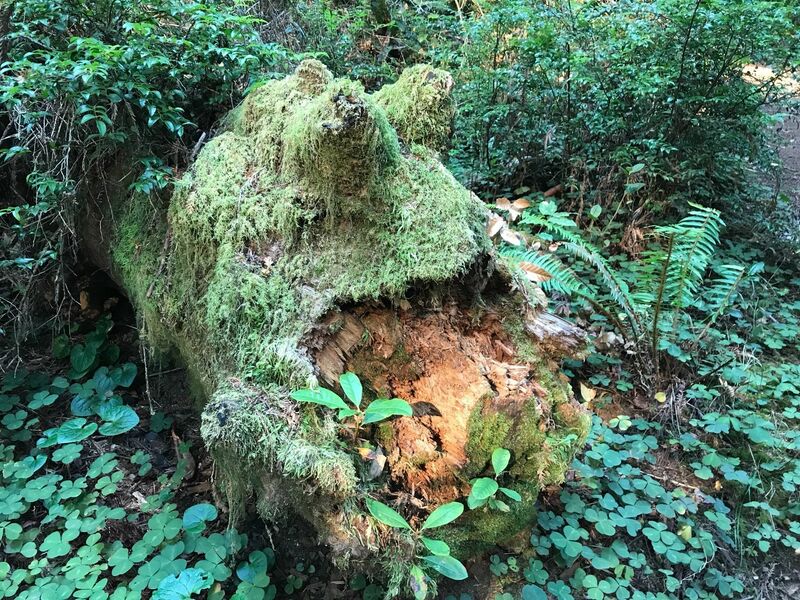 Vegetation is predominately red alder which will eventually give way to fir and second growth redwood. The topography is fairly steep with elevations from sea level to 1277'. 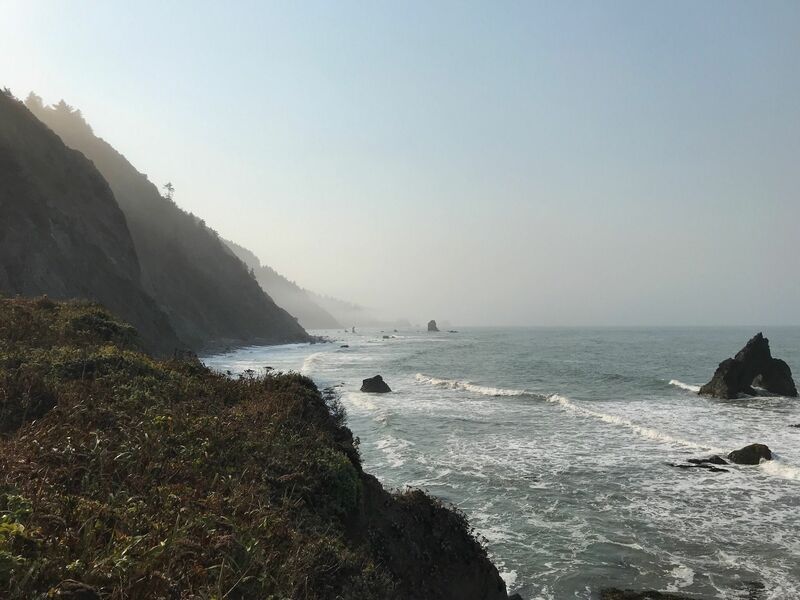 The predominant mountain range is oriented in a north-south direction with steep cliffs adjacent to the Pacific Ocean, making the bulk of the rocky sea coast generally inaccessible except by Damnation Trail and Footsteps Rock Trail. 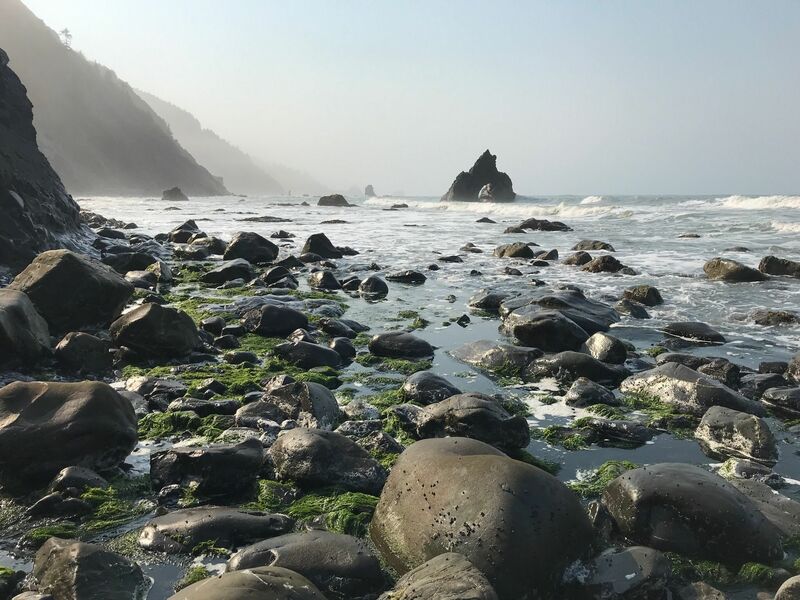 Wilson Beach or False Klamath Cove, 1/2-mile of sandy beach, is meant for strolling and provides excellent tide pool viewing at low tide. 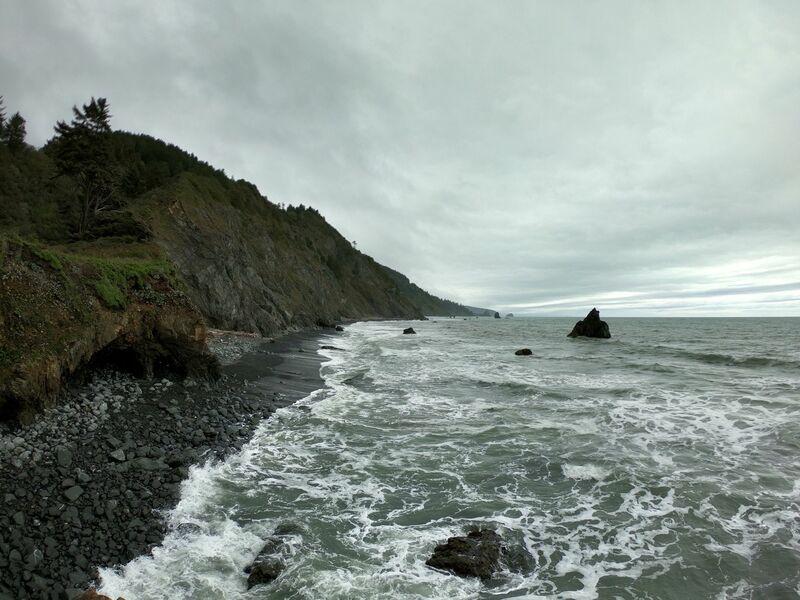 It is not safe for swimming due to the steep beach slope, rocky conditions, frequent rough seas and cold water. 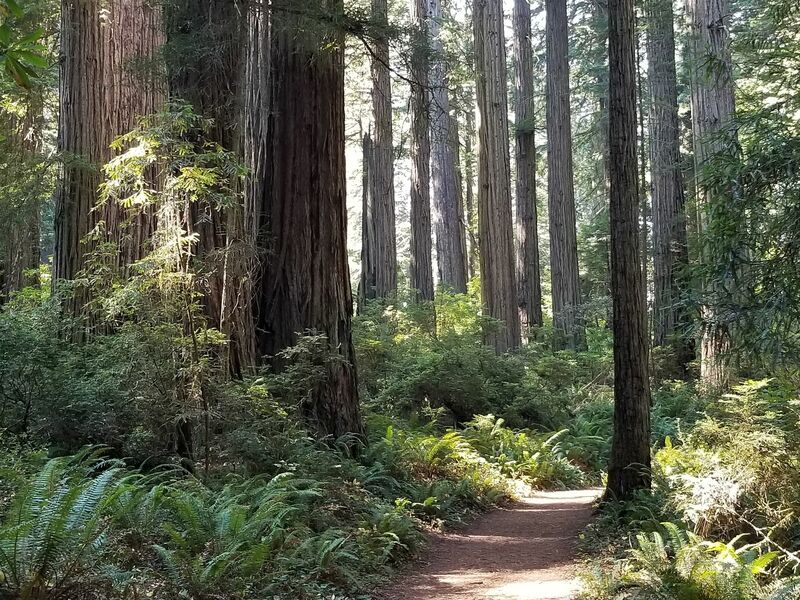 This park, along with Prairie Creek, Jedediah Smith, and the National Park Service's Redwood National Park, are managed cooperatively by the National Park Service and the California Department of Parks and Recreation. 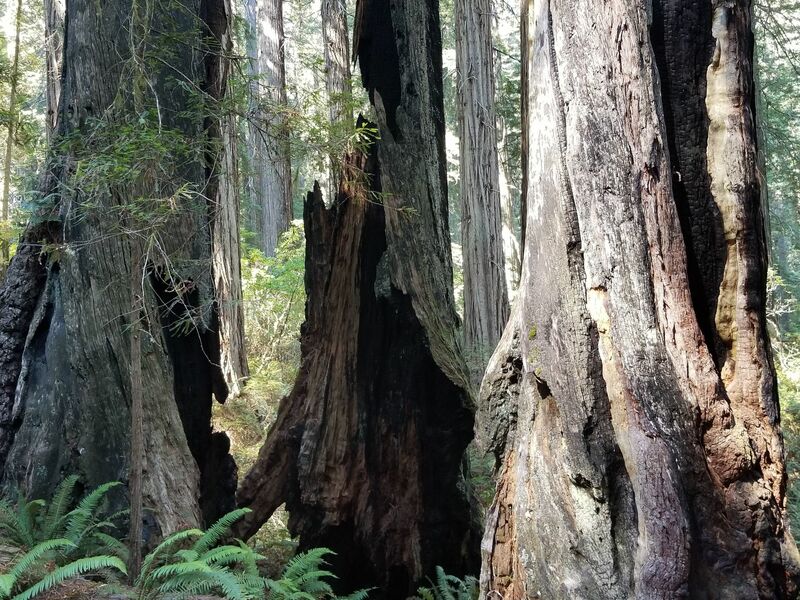 These parks make up 45 percent of all the old-growth redwood forest remaining in California. 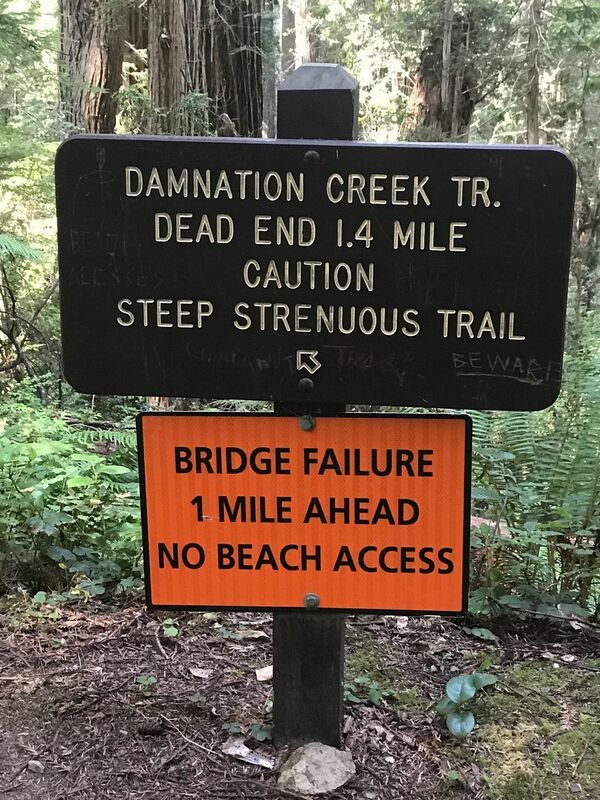 no beach access”, I went for it anyway, and after switch backs going down for a good 45 minutes, you get to the bridge, which is actually the 2nd bridge of the hike. It was easy to bypass the bridge by dipping down to the right of it. Once you pass the bridge, you are soon greeted by the ocean with an unreal view!! There’s a rock that has a path up on top of it, its in the water, I sat there for my lunch and say an otter! Hike back up is a bit of a workout, but well worth it! Trail head is off hwy 101. Some traffic noise at the beginning that gave way to sounds of the ocean. Great view at the end of trail but we couldn’t make it to the beach as it was high tide. I would definitely categorize this trail as strenuous, especially for the hike back up. 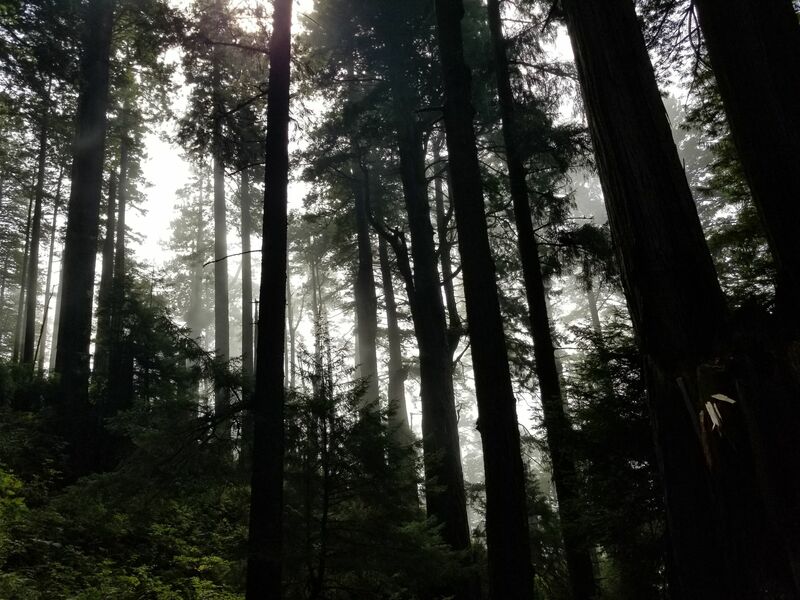 It starts out in the misty silence of the Redwoods and descends quite sharply. Some spots might be slightly slippery during the descent so make sure you have good shoes. The bridge at the very end is still closed but we managed to get to the beach by going under the bridge. You only need to hop across a tiny stream to get to the other side. 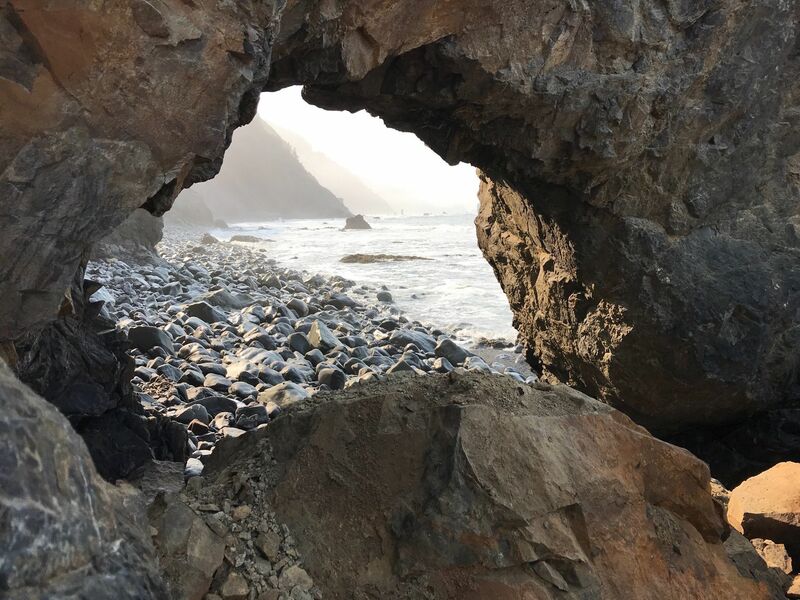 The views of the ocean are well worth the hike! It took us about 1.5 hours to descend to the beach and slightly more to climb back up, making it a 3-3.5 hour hike if you don’t spend too long at the beach. This is a short distance but vertically challenging hike, with a few sketchy spots of single track. It was really a beautiful trip through the quiet, almost "rain forest" cool coastal mist. I started out feeling a bit chilly on the descent to the rocky beach, but surely warmed up for the ascent from the ocean. This is a gem! 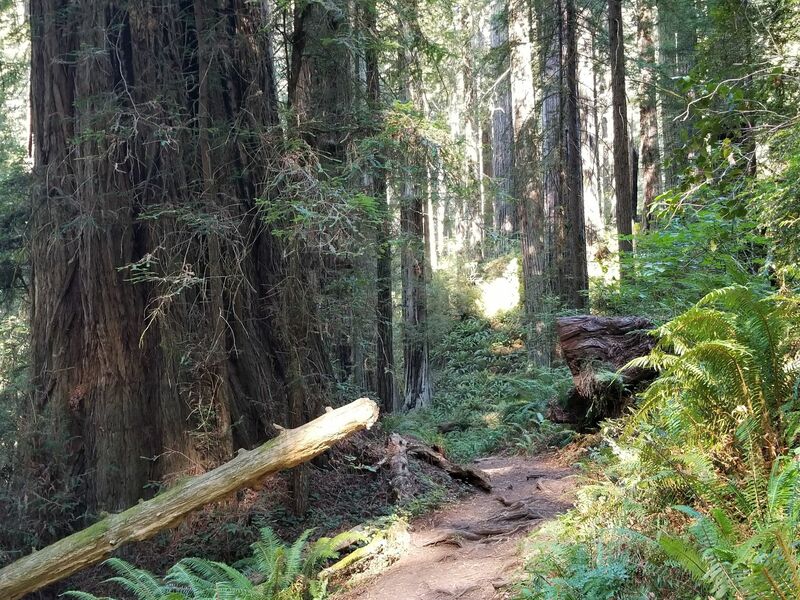 This is a great hike through redwoods down to the ocean. The coordinates from AllTrails took me right to the trailhead. 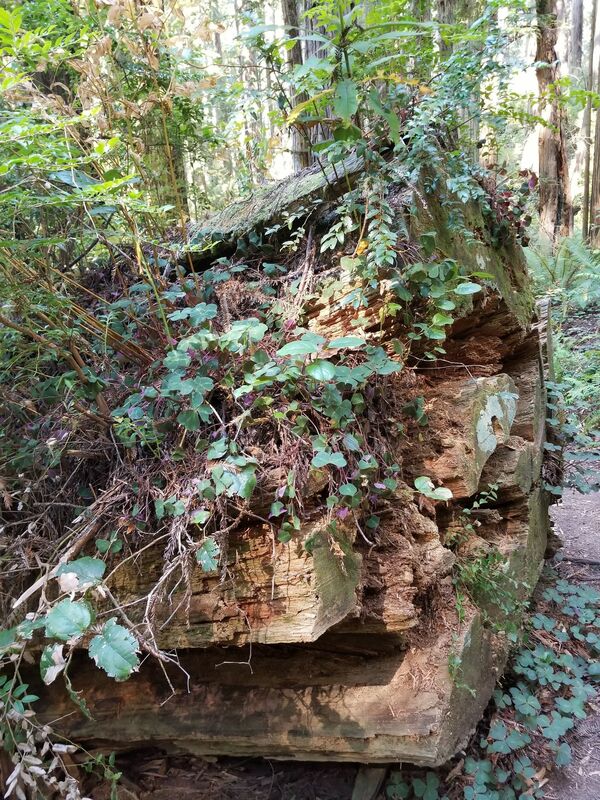 A sign there said the trail was closed .10 miles from the ocean, but I decided to hike in anyway. As it turns out, there are alternative ways to get to the ocean at the end of the descent. 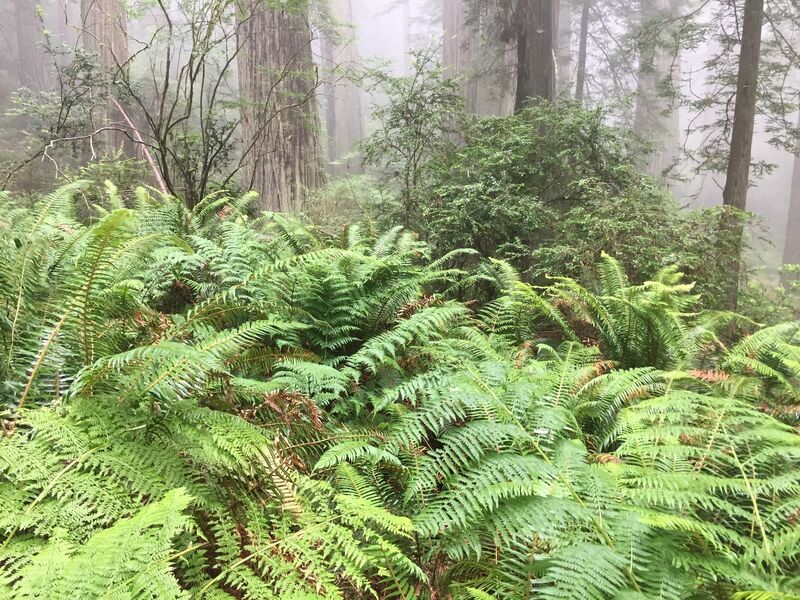 That part totally makes the hike great, descending from sunny redwood groves to a cool, fog-shrouded rocky beach. 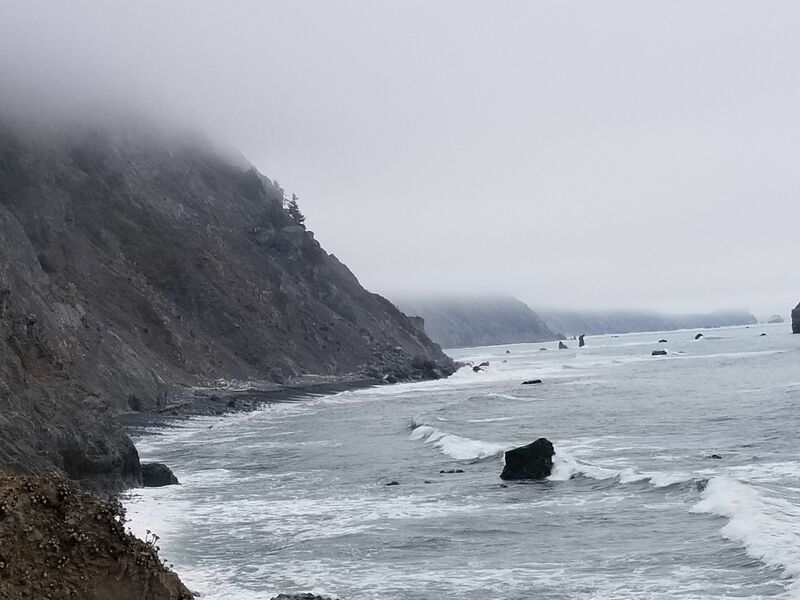 The sign at the trailhead says it is 2.1 miles to the ocean so the round-trip is 4.2 and not 3.5. (See picture). The trail starts of wide and fairly level and then begins a fairly constant descent. 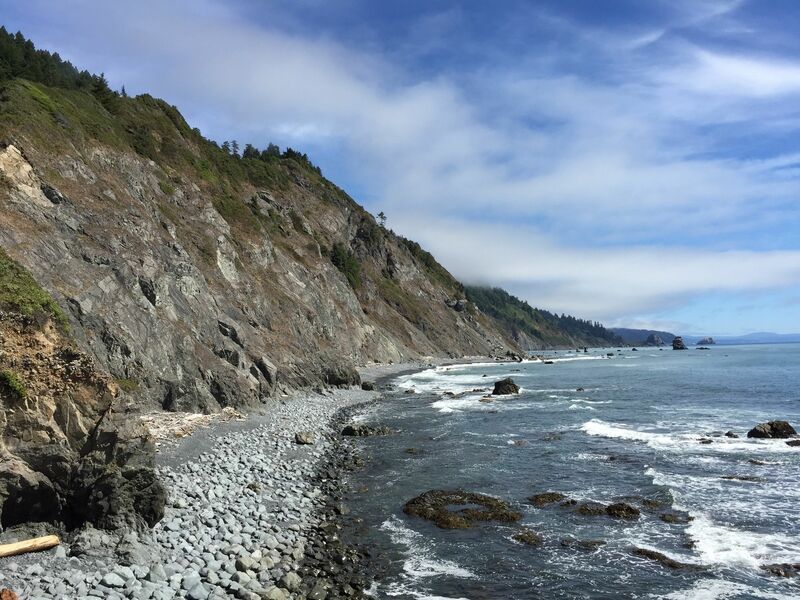 After 0.7 miles it crosses the Pacific Coastal Trail and that's where it really gets steep; countless switchbacks until the ocean. The whole hike took me a bit over three hours, including about 20 minutes before heading back up. I'm still getting into shape so I'm sure it's possible in less than two hours. 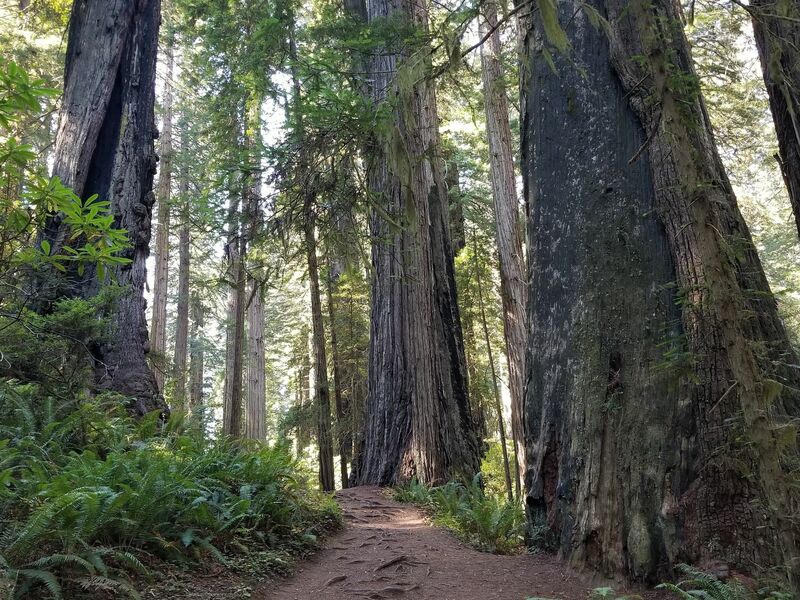 Because of the beautiful redwood trees, so many hikes in this area are great. 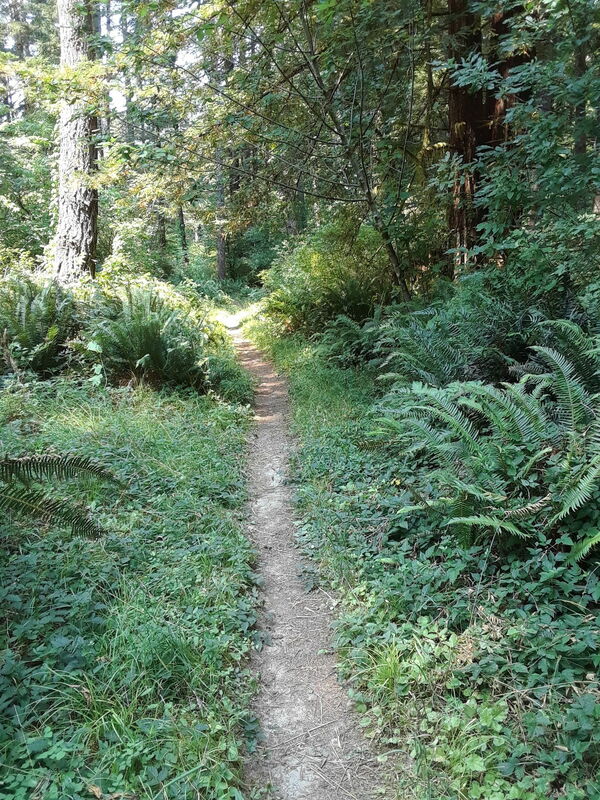 Damnation Creek Trail is yet another one of them, very much worth doing, particularly if you want a bit of a workout. 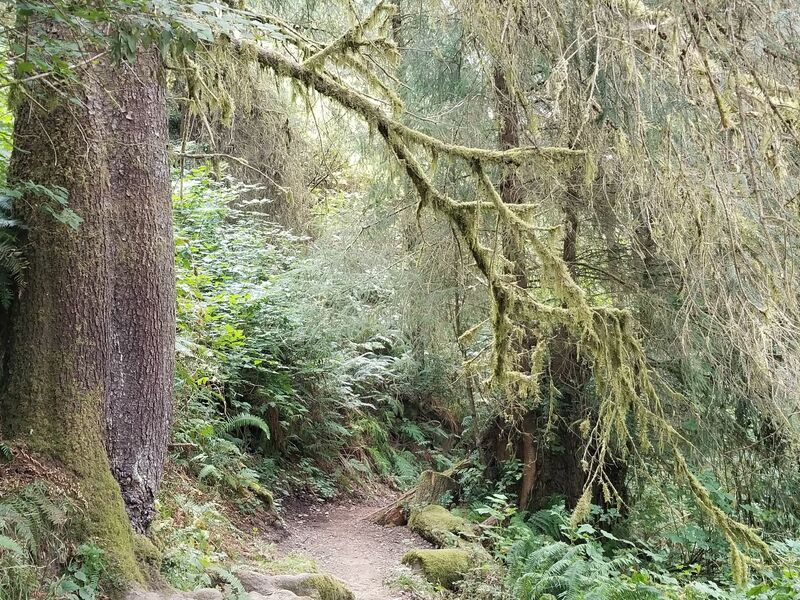 AllTrails rates this hike as moderate, but the state park literature calls it strenuous. If someone were passing through the area and only had time for one hike, this would be a good one for it. I have a good walk, and finally a surprise is waiting. An open sea with no view. It was the best. I felt like I would stay there forever. Return is basically climbing and feeling a little bit tight. We recommend hiking with trekking shoes. One of the most beautiful hikes I have ever done. 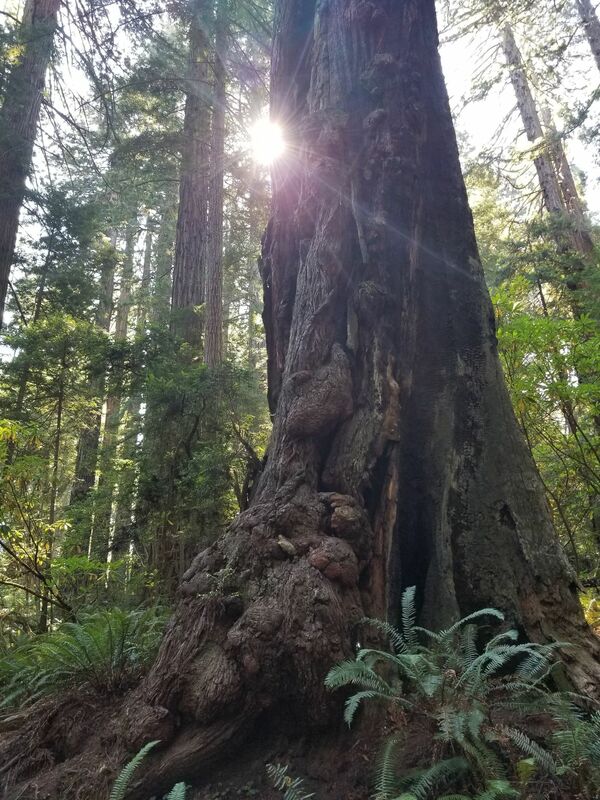 The god rays created by sunlight piercing through the fog and the redwood tree branches was incredible and I captured some screensaver worthy photographs. The beach was also spectacular although a bit cold. The trail is steep but not too bad. 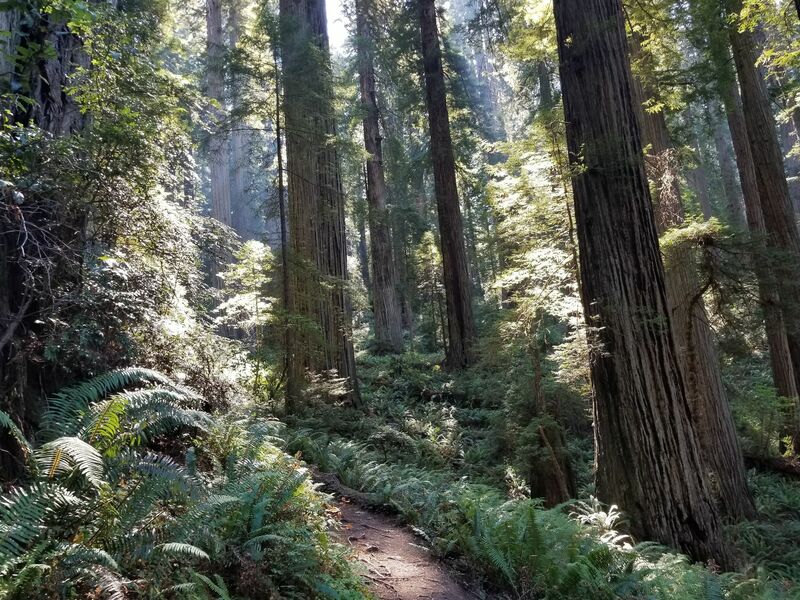 One of the best hikes in Redwood NP and SPs in my opinion. This is a gorgeous hike but it is definitely difficult, not moderate. Going down is pretty easy but the hike back up is very steep and it’s entirely up hill. I definitely wouldn’t take young children on this. 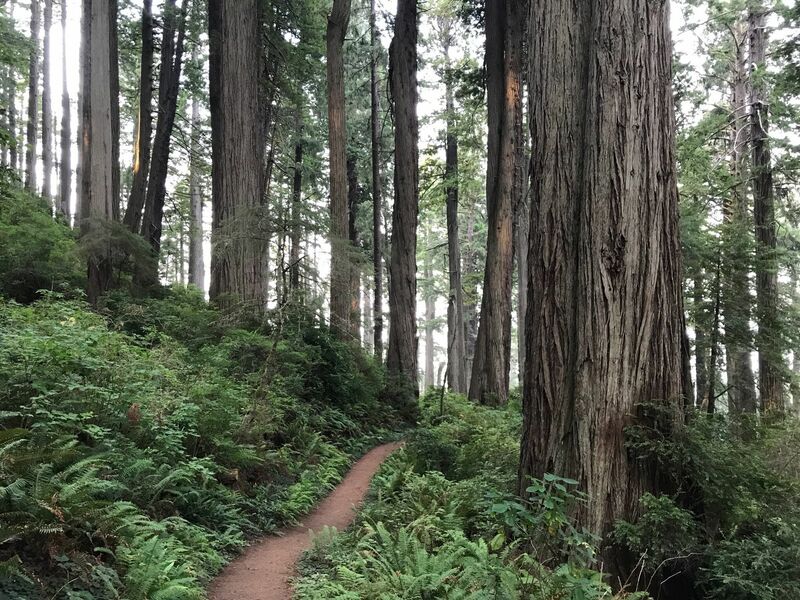 Well worth it for the gorgeous open views of the Redwoods and finishing at the ocean. Wow! One of the best hikes in the area. 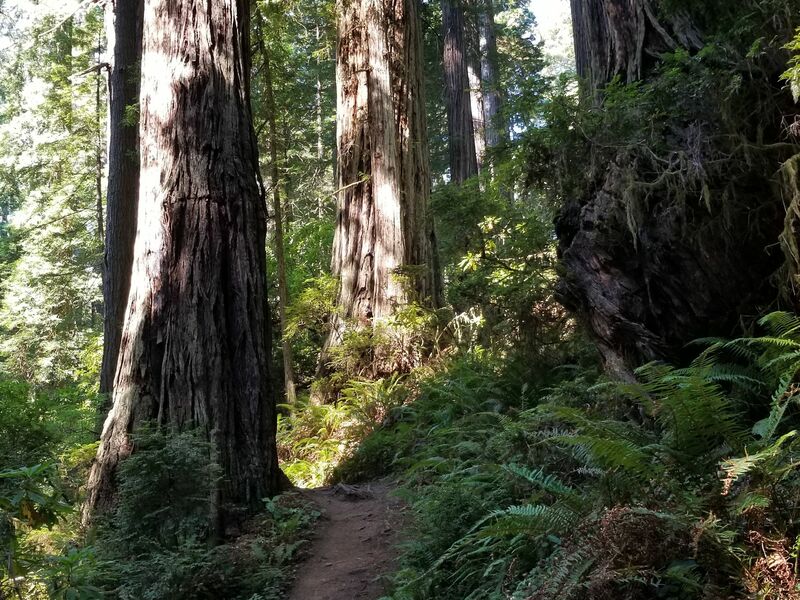 This trail is actually a 4.2 mile out and back, with the latter 1.4 miles quite strenuous, but the views and magnificent terrain and ancient redwoods make it worth it. Make sure you go down to the beach at the end to ponder nature’s beauty at water’s edge. 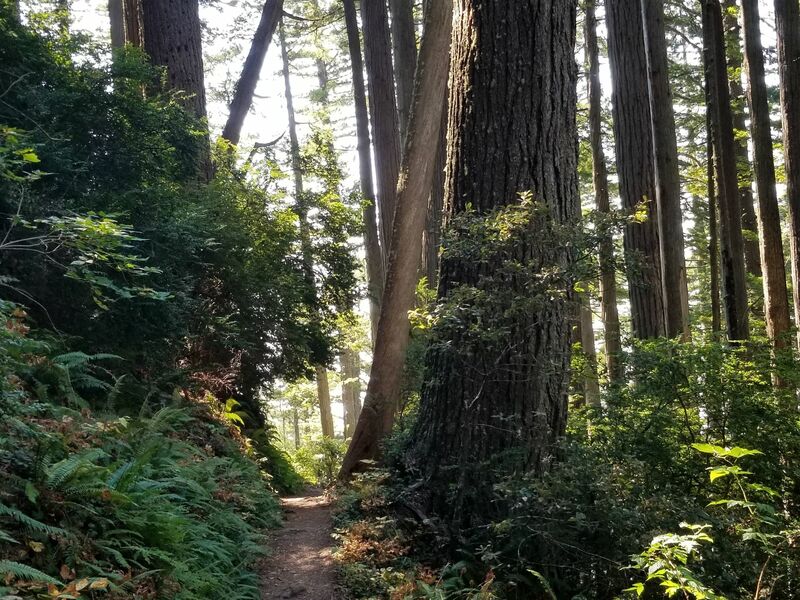 Beautiful redwoods hike that ends at the ocean. Sign says trail ends at bridge but I crossed it with no problems. If you don't feel comfortable using the bridge, just to the side of it you can go down into the creek and up the other side. As of August 2018 a bridge is down, so this trail is closed. This is one of my absolute favorite hikes. 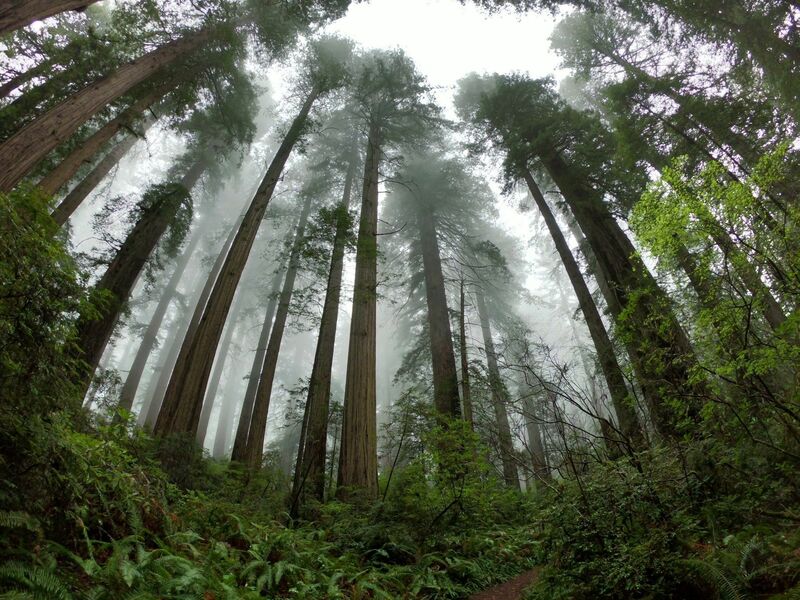 The solitude of this redwood atmosphere with rain or fog is stunning. Hiking down you won't think about the return climb in store for you, which can be difficult for some folks I'm sure. Look for rabbits among the ferns, salamanders, wild irises, and succulent hens and chicks in the cliff-face when you get to the beach. If you walk the beach at low tide and explore the tide pools among the rocks, starfish, anemones and other creatures await, and I never want to leave. The highlight of our trip to Del Norte. 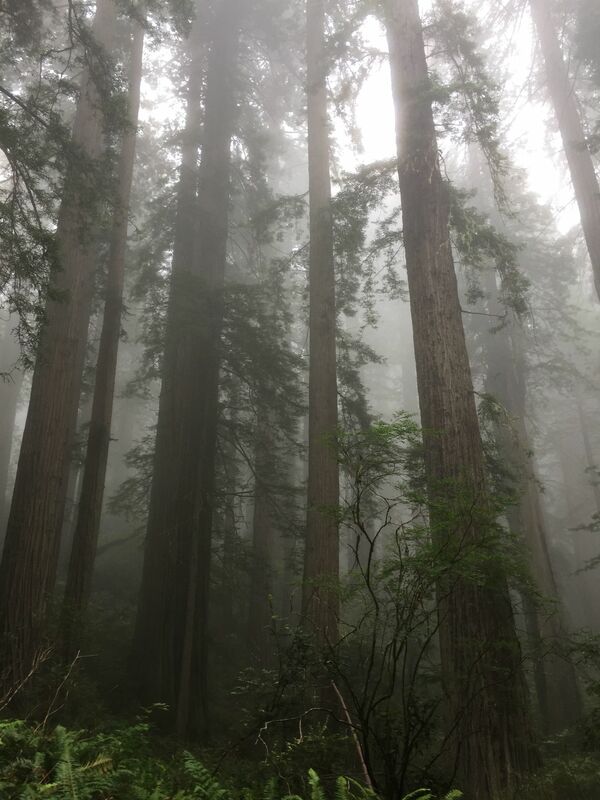 Best when covered in fog, it's pretty mystical with it's towering Redwoods. 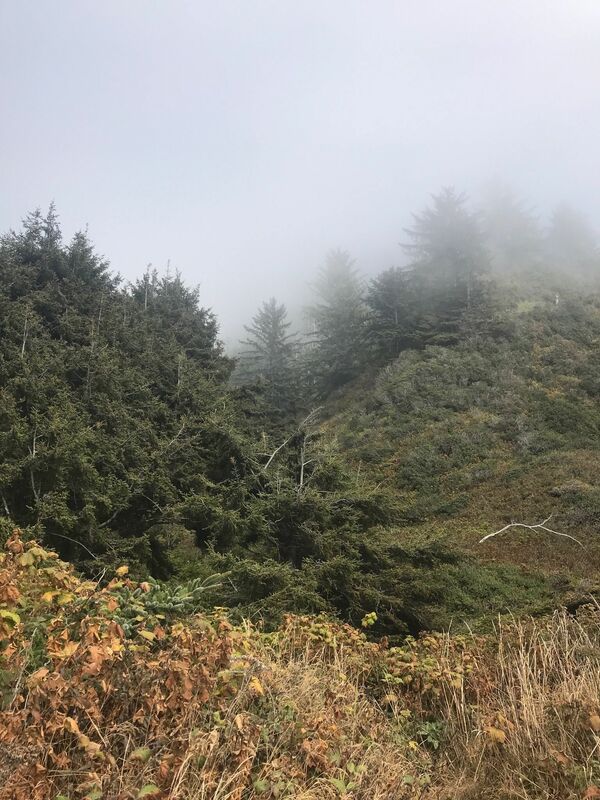 We found the cove to be an added bonus, but if you are short of time or if the elevation is off-putting, I'd recommend doing the first half in the fog down to the trail sign then climbing up again. 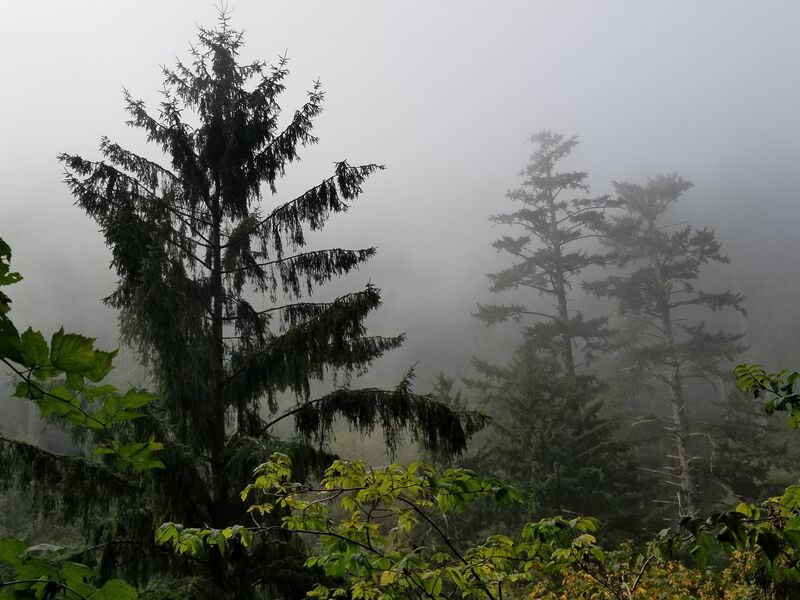 The trade off we found is that when the trees are covered in fog the cove is too or when sunny both are. Also be aware of any scrambling paths, we went up one to save some time and it didn't catch up to the path again so it was a fun 20 minute detour. Gorgeous hike! 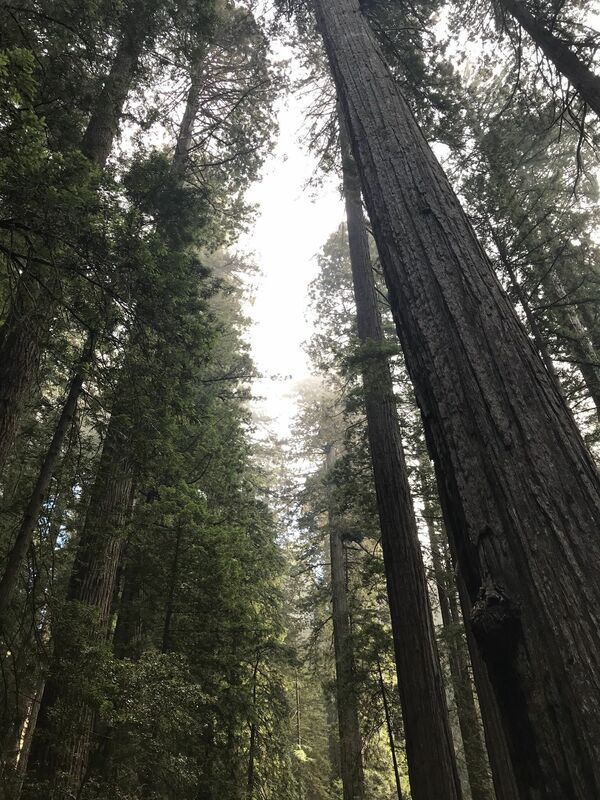 The mist in the redwoods is amazing! Bridge says it’s not in use but I had a party of 6 and we all crossed and made it to the ocean just fine. Great day trip. We did the hike with a 13 and 2 year old very doable for all abilities! Fantastic hike! Loved the variety of vegetation and forest area and the beach at the end. The trail signs say it is closed but just ignore it. 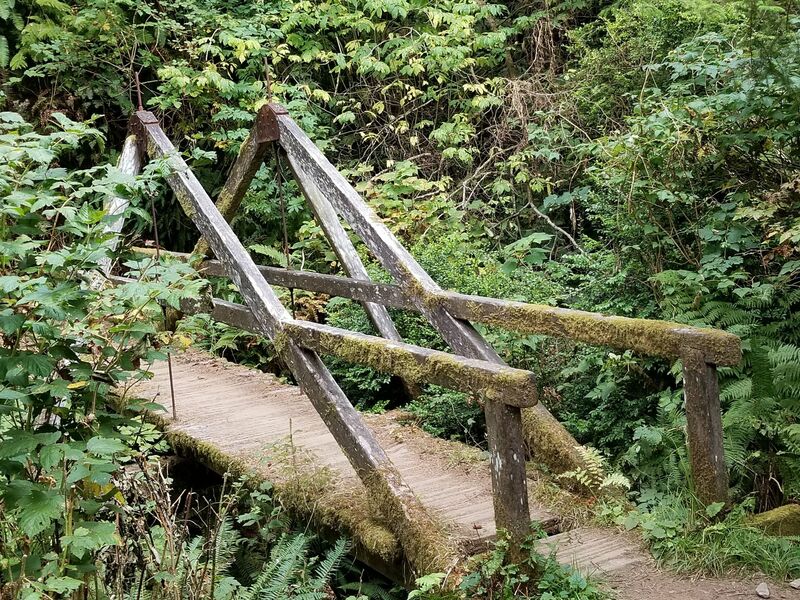 The trail is usable and the bridge is fine. It looked like there was a bit of a washout which makes part of the trail trickier but definitely manageable. We saw lots of children and old folk using the trail so it is usable for all ages and types. So worth the steep climb down and back for the ocean/beach at the bottom. Good beach views at end if you go past the broken bridge. Mud and trail washout makes conditions difficult for unaccustomed hikers closer to sea level, we encountered several people who turned around early. 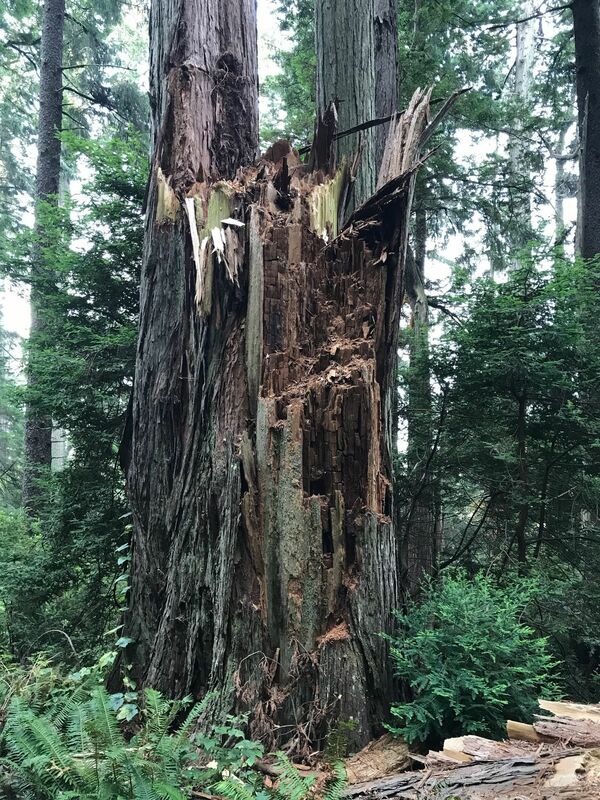 Honestly couldn't have asked for better, other than the state penitentiary fire department using the trail also to clear debris from a recent storm, which was a little freaky for two women. If you come to the sign and see its closed, don't stop! The bridge is deemed unsafe but i'm sure you can slide into the creek and cross it relatively easily. We took the bridge one at a time but it's wobbly. The hike back is killer, layer up on the way down and strip to a tank top or t shirt because the hike up will challenge anyone. Pack light. One of my favorite trails. 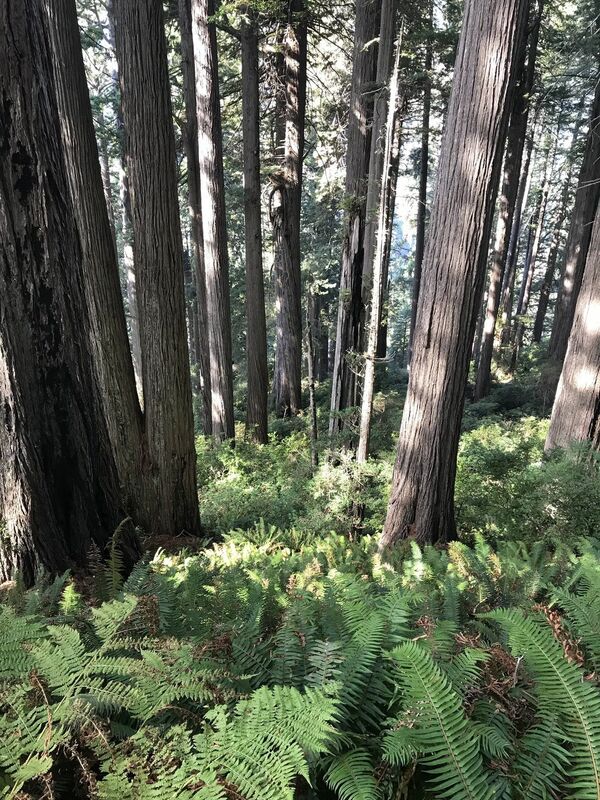 Great combo of giant redwood trees, creeks, ferns, ocean and a good workout (heading back). The trail head is not well marked but the post is there right off 101 right in the middle of the current road repair. Make sure you enter to the right side of the trail sign. Down slope was a bit slippery, And fairly steep in couple sections, I can see it getting dicey under wet condition - wear good hiking shoes if raining. Hiked this April 4th. The hike was beautiful. The trek back up was a little rough but definitely manageable. One of my favorite hikes of all time. The payoff was great! Awesome trail. Time yourself and know your limits, coming out can be tough. 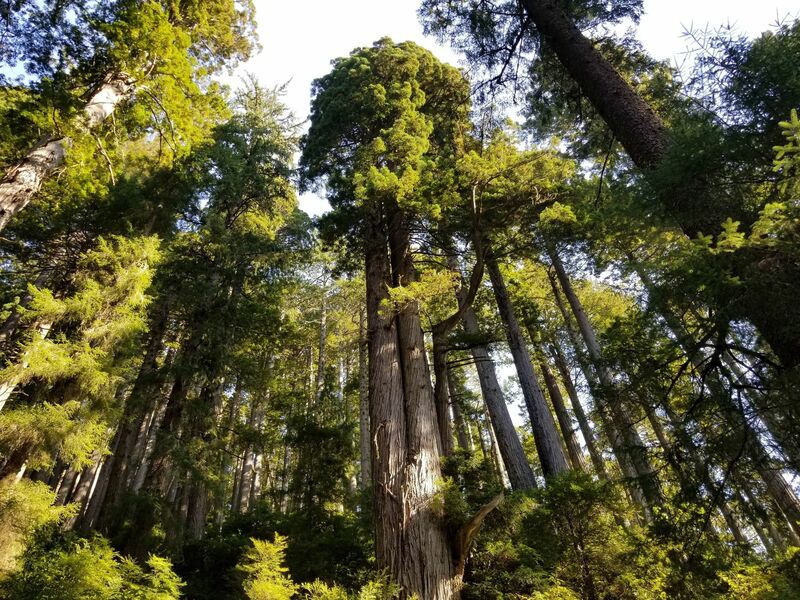 Amazing seeing old growth to the beach. Can’t beat. Awesome hike! 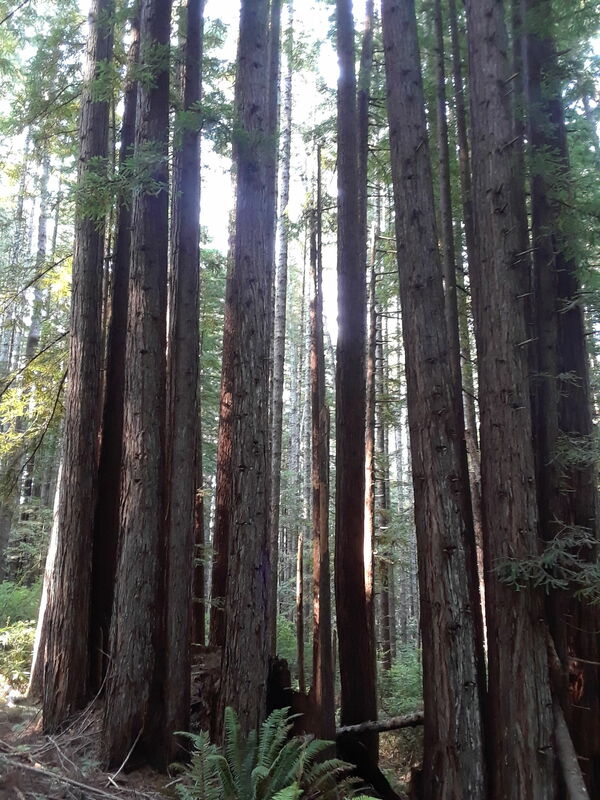 I loved hiking through the beautiful redwoods and coming out at the beach. The hike back up is a bit tiring but soo worth the it! Great trail as long as you can do sustained long hills. There are a couple 1-1/2 to 2 miles long. The only part of the trail that is flat is the actual loop. That's the reason i rated it as difficult. I don't want anyone going out of their comfort zone or ability level. Big upside for most is 99% of this trail is shaded. 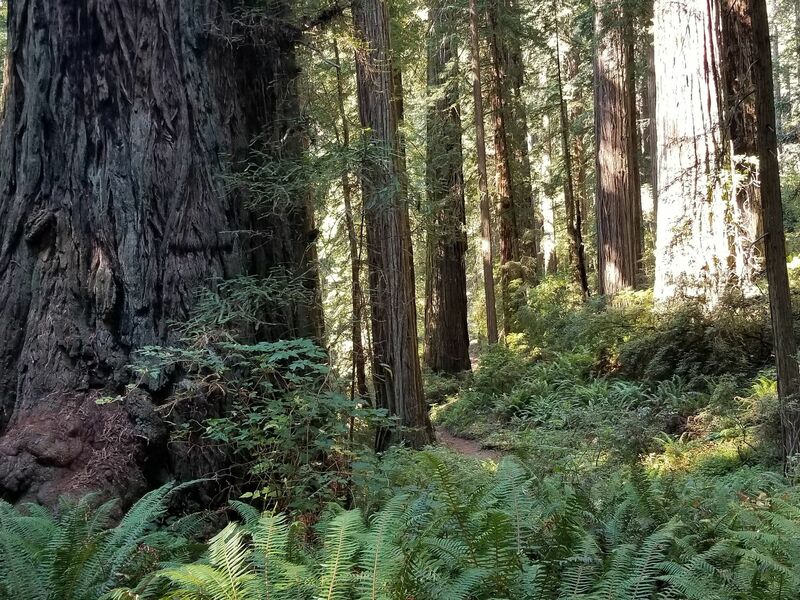 This part of the trail has hardly any redwoods where the northern part has many more redwoods. 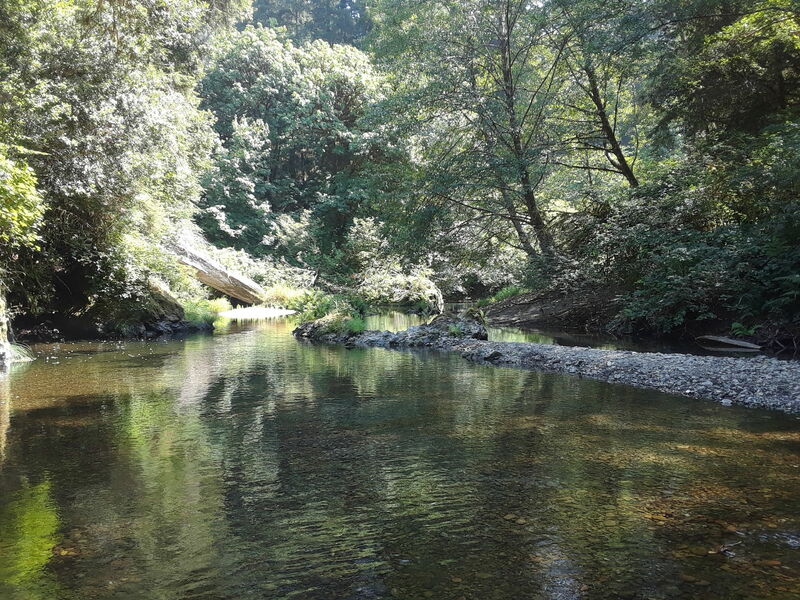 The creek itself is beautiful but you only see it when you cross and no bridges so prepare to get your feet wet... 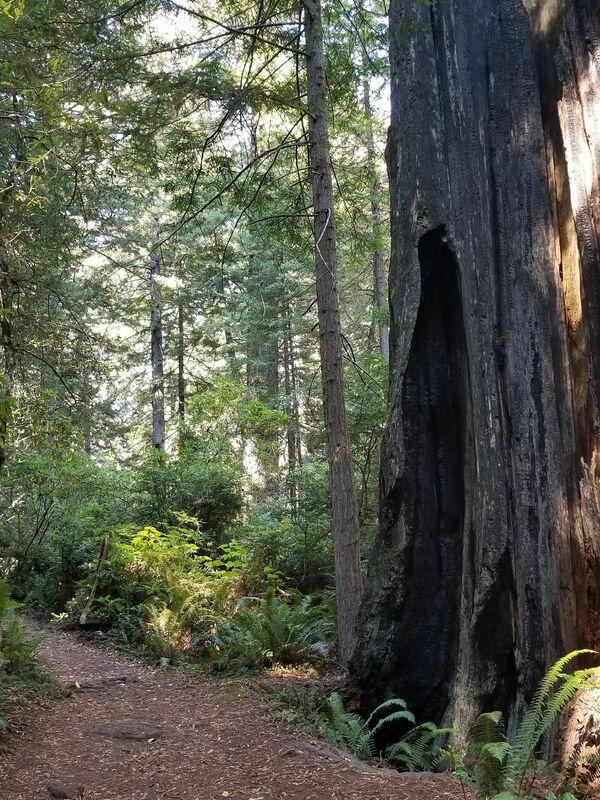 Overall Mill Creek Horse Trail is prettier because of the redwoods. 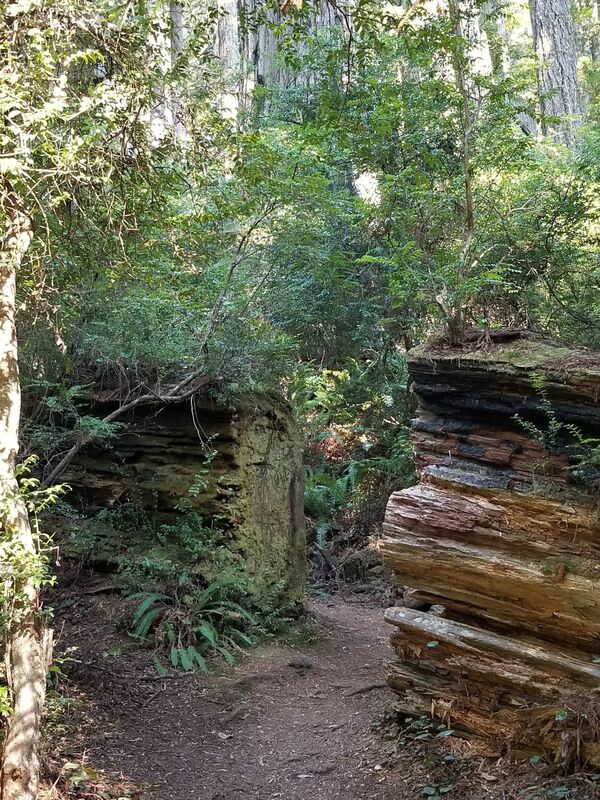 Most of the trail itself is old roads which are no longer used but are still beautiful. 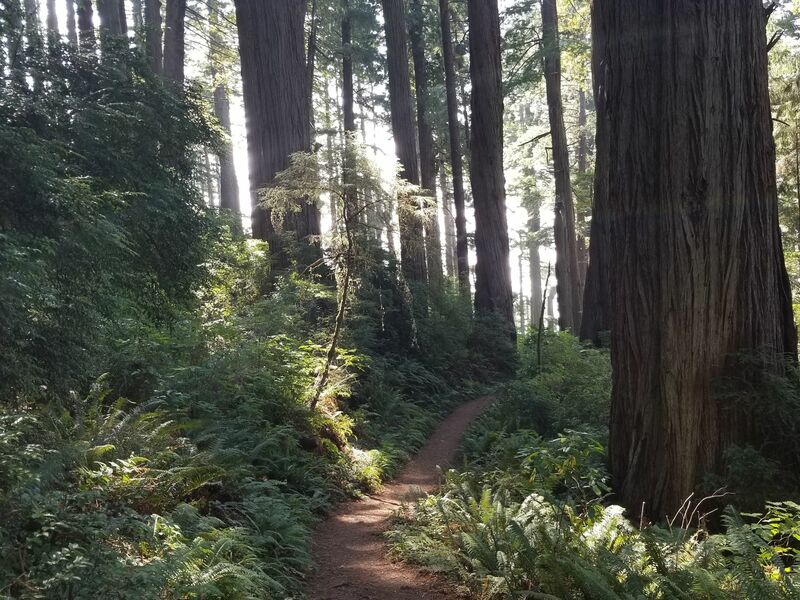 Damnation Creek Trail is a great hike through the coastal redwoods, winding through literally thousands of old growth trees. 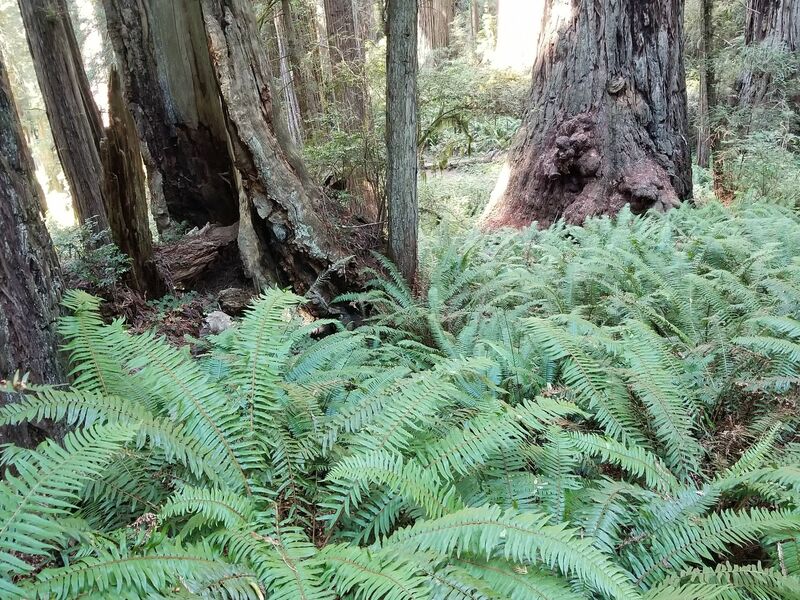 The trail is lined with huge ferns and lush redwood sorrel. If you don't want the big elevation change, just stroll up the first half mile or so of this trail. The footbed is ideal: wide, softly cushioned, and few roots or rocks. 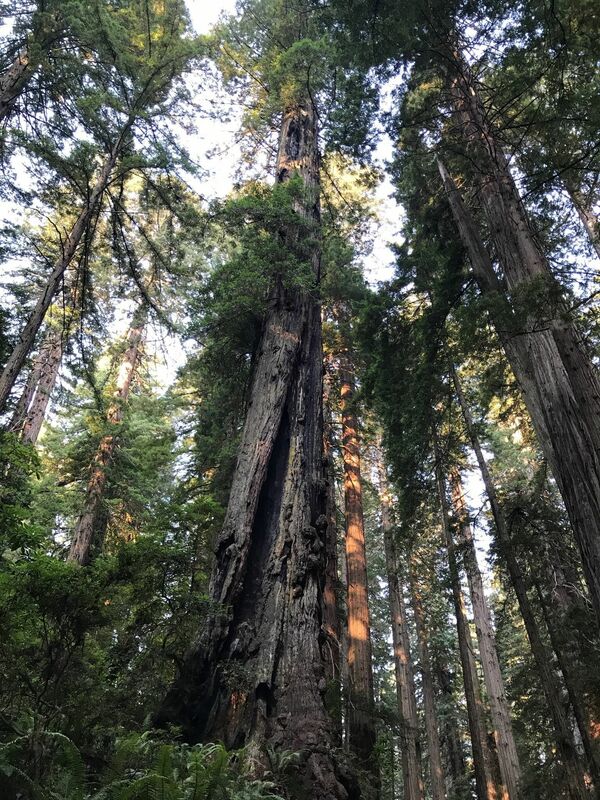 It's one place that you can gaze up at the giant trees without tripping -- don't try that on the Boy Scout Tree Trail, where the nearly continuous nest of hazardous roots demands constant vigilance. The trail sign says steep and strenuous, but in fact the route is well graded on 23 switchbacks (some very short). The only steep part (temporarily) is climbing around the derelict bridge at the beach end... a bit slippery if there is mud. The return hike climbs steadily but seems mild despite the 1100-foot ascent. Perhaps the fantastic forest scenery distracts! 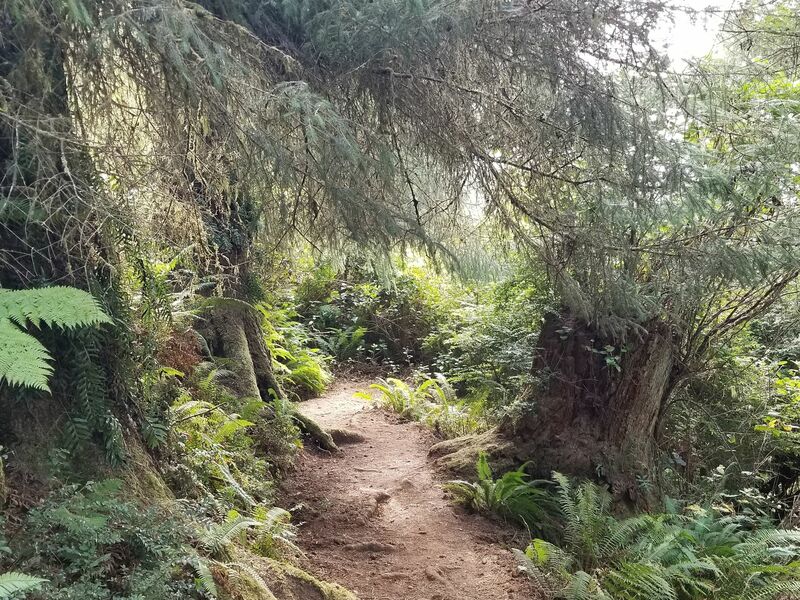 Take it slow and easy, and the beautiful hike ends too quickly. Once the trail crosses to the west side of the ridge, the bad highway noise (trucks ascending the mountain) soon fades. Frankly we did not notice the intrusion until the return trip. The moisture from the Pacific must keep the sea slope wetter, since it didn't appear dried out in August like other areas did. 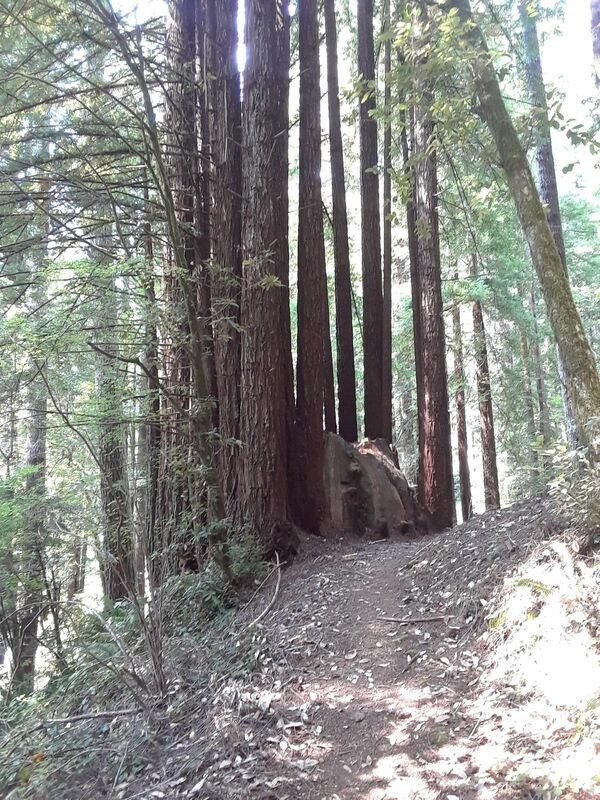 About halfway to the bottom, the trail slabs a steep gorge; you are looking out at the mid-story of redwoods still towering above, but the trucks originate far below in the gorge. It's a great way to appreciate how tall these "plants" really are! 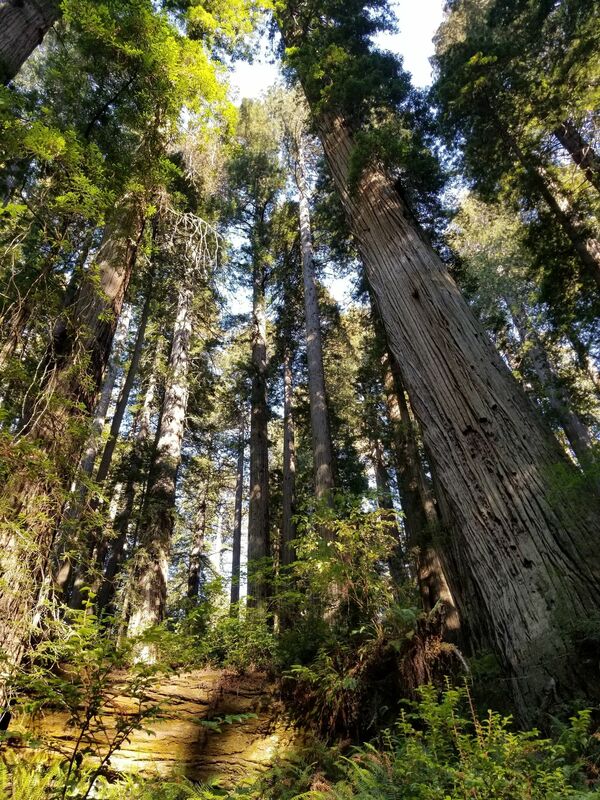 Then the redwoods give way to mature western hemlock and other trees. 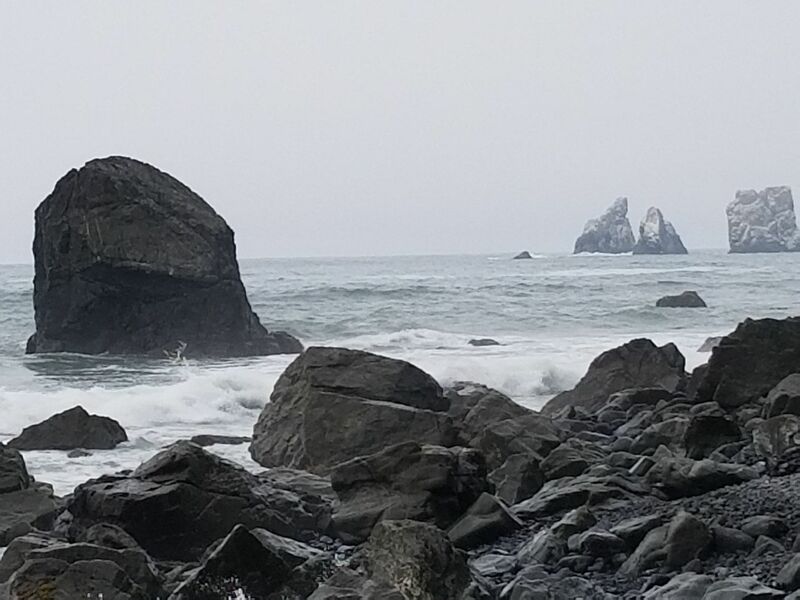 The beach itself is long and lovely at low tide, with natural arches in the cliff and sea stacks. 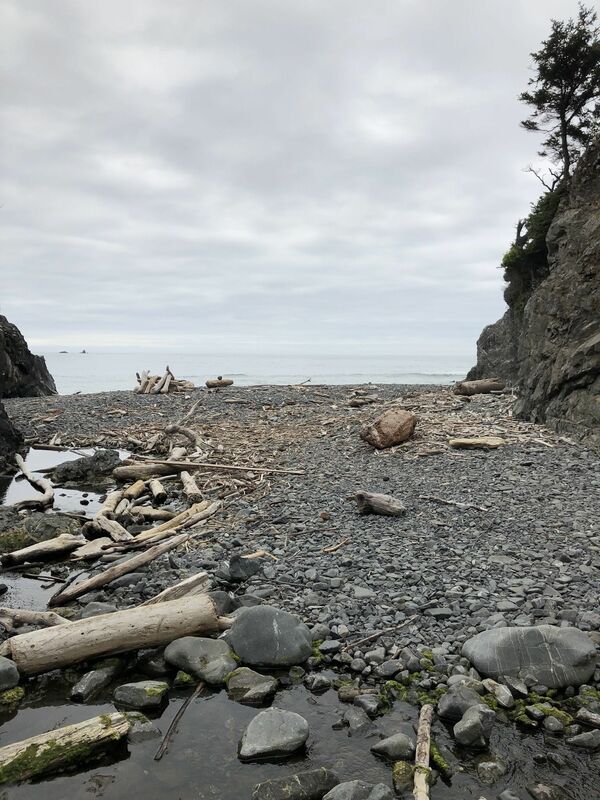 You could walk at least a half mile south along the cove's beach, but pay attention to an incoming tide or you might get trapped! 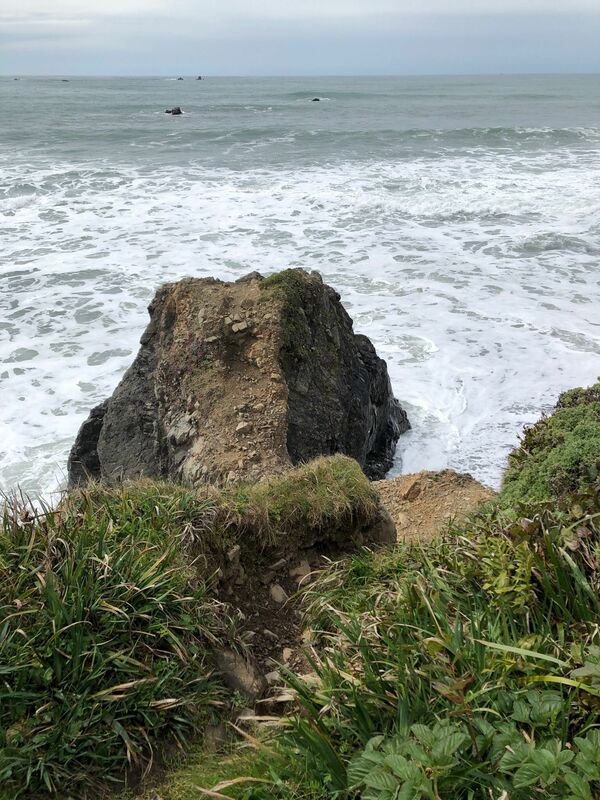 Near high tide, the beach would be inaccessible and dangerous. We had the beach all to ourselves for an hour in the late morning, at the time of day that other trails already are jammed. 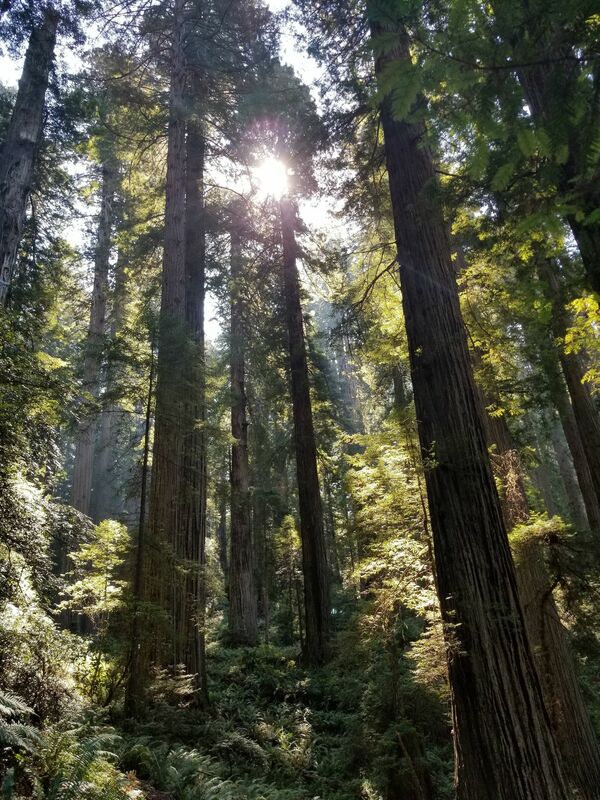 Definitely arrive early if you want the experience of complete solitude among the splendor of the redwoods. 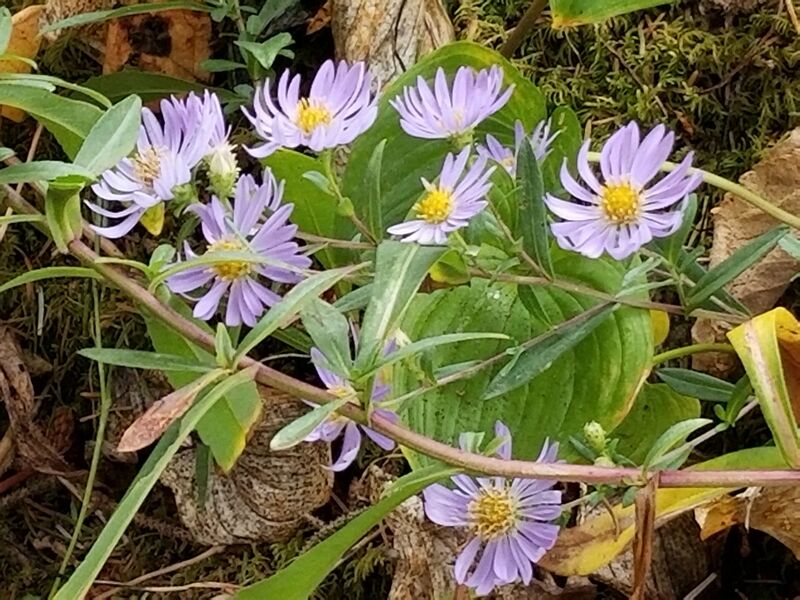 They are beautiful even if there is fog, and the trail is easy to follow. The "real" trailhead is right at mile marker 16.0. The parking spreads out along the road, so there are many trampled exits like a river delta. Go have fun, whether or not you venture beyond the upper, nearly-level portion of the trail! Great interpretive trail for kids with signs to explain a few things. It was the only trail of 4 in the park today that I saw anyone. A family of 4 with 2 small children enjoying listening to their father while he read one the info from one of the signs... A sign on this trail was where I learned the term "goosepen". 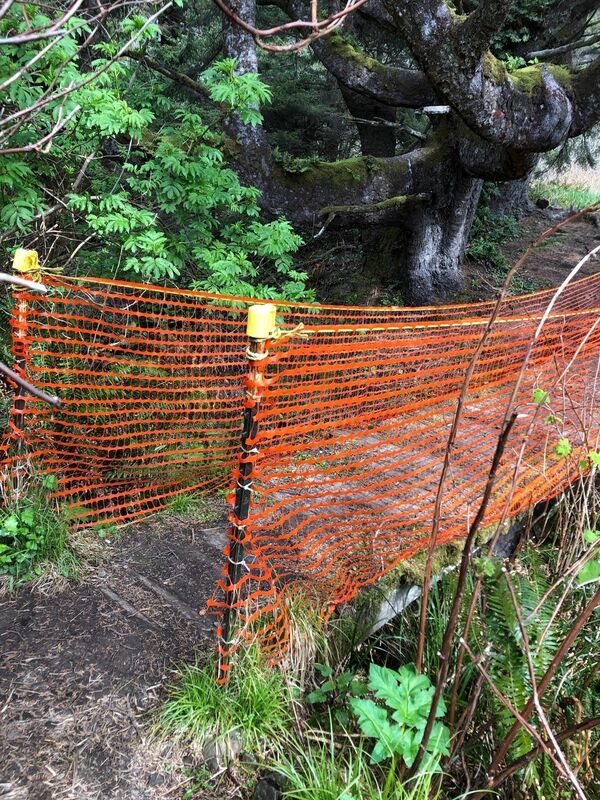 It's located right by the entrance station and need of a few repairs but the park was closed for a few years. It'll take a while for them to get caught up. 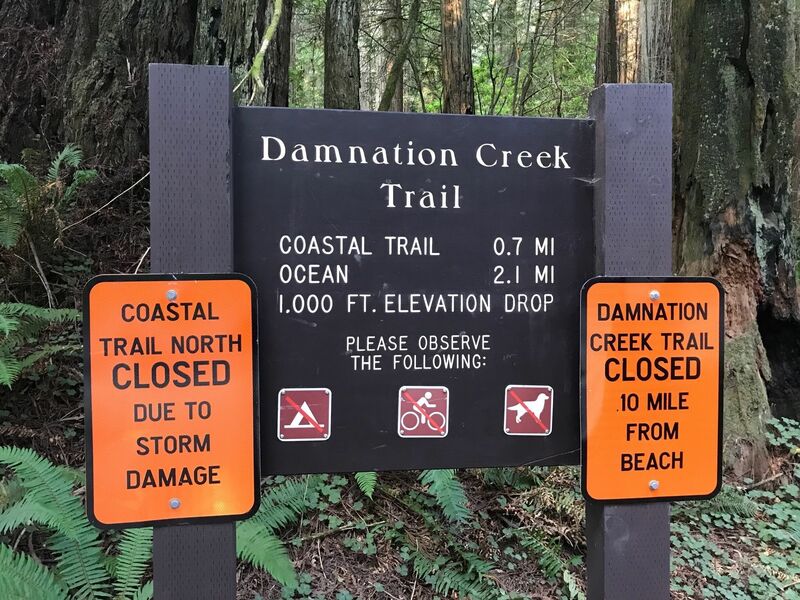 Jonathan M. recorded Damnation Creek Trail plus drive to motel! 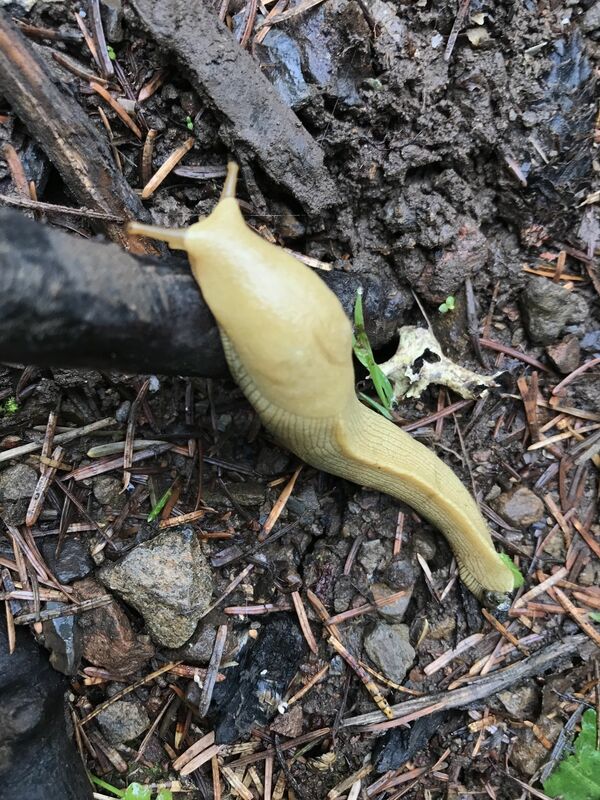 Kyleigh Morgan recorded beautiful and majestic!